Welcome back to 'Assistant Editors' Month', today we look at an "Iron Man" story unlike any other. 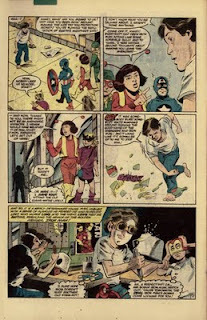 During this era, ‘Iron Man’ was written by Denny O’Neil. 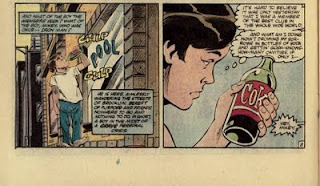 Tony Stark had a relapse of his alcoholism, which cost him control of his company Stark International and forced him to give up his Iron Man armor. Obadiah Stane took over the company(renaming it ‘Stane International’) and James Rhodes(Stark’s Chief Of Security) became the new Iron Man. Stark eventually defeated Stane and regained control of his company in 'Iron Man' #200. In the corner box, Iron Man is turning his back on the issue, and we get the checkerboards and ‘MC’ logo parodying DC’s logo of the 60s again. 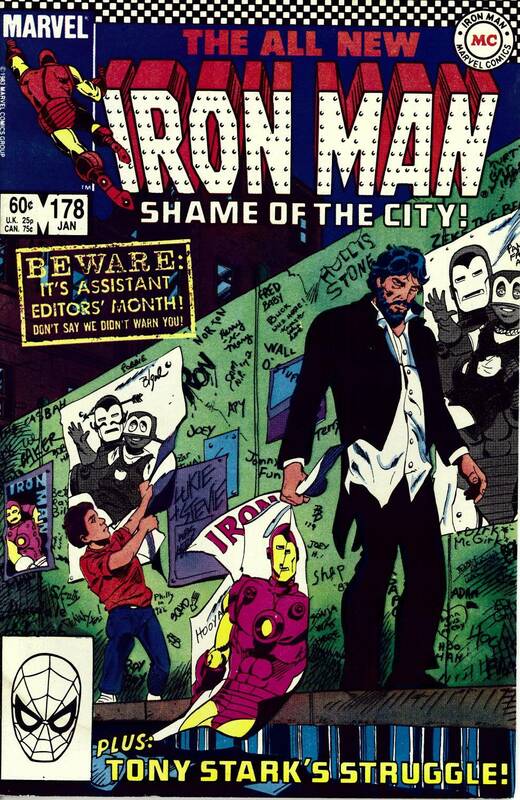 A disheveled Stark is walking the streets while a boy tears down & defaces posters of Iron Man. Also, if you look closely at the graffiti, you’ll see “Luke + Stevie was here”. The cover was drawn by Luke McDonnell and inked by Steve Mitchell, that’s a nice way to “sign” the cover. 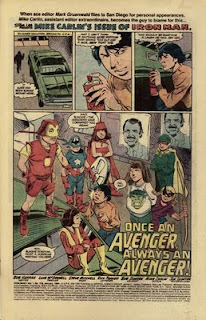 'Once An Avenger, Always An Avenger' was written by Bob Harras with art by the aforementioned McDonnell and Mitchell. 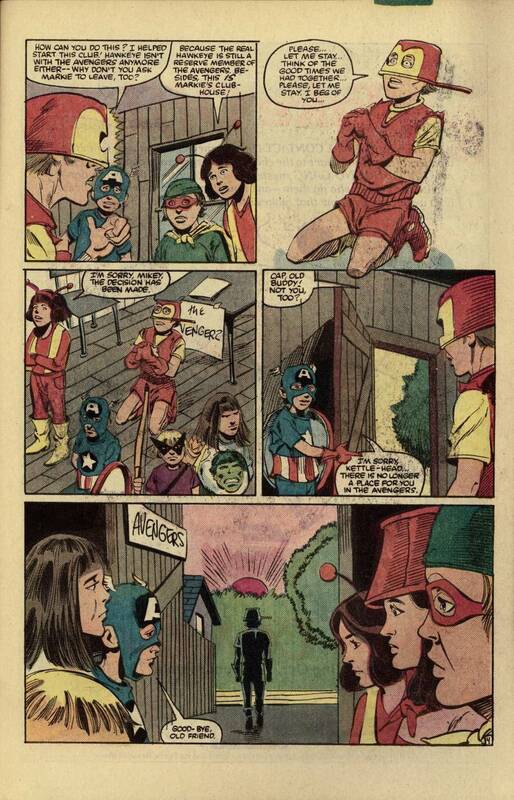 We open on a kid contemplating vandalism, but he is stopped by the Avengers…or more accurately, a group of young children in homemade “Avengers” costumes. We learn the would-be vandal is Blackie Donovan and the Kostumed Kiddies have pledged to watch the car while its owner is hospitalized. Donovan promises them they will pay for their interference, while he is taken home by Officer Kelly, the neighborhood beat cop. 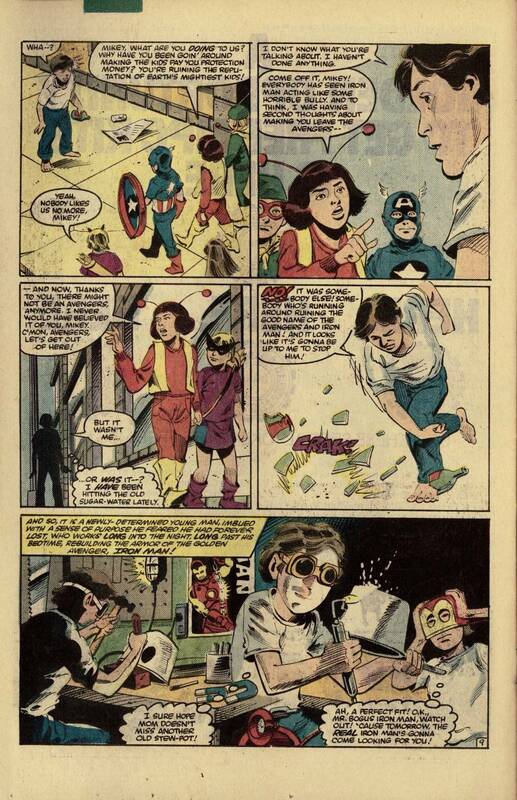 He wishes Donovan would act more like the "Avenger" kids and we get the impression this isn't the first time Donovan has been caught being a bad boy. 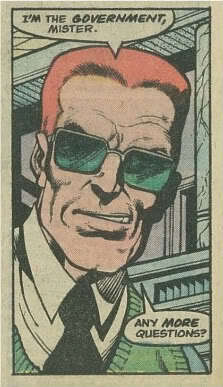 I've always thought that Officer Kelly looked like the Avengers long-time Government Liaison Henry Peter Gyrich. I wonder if that was intentional? Just like the “real” Avengers, the kids hold a weekly membership meeting, “Iron Man”, whose real name is Mikey, is commended for catching Donovan, but then gets some bad news. 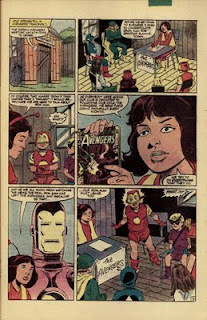 In the (then) current issues of ‘The Avengers’, Iron Man had recently left the team, therefore this Iron Man must leave their team. This part of the story really hit home for me. 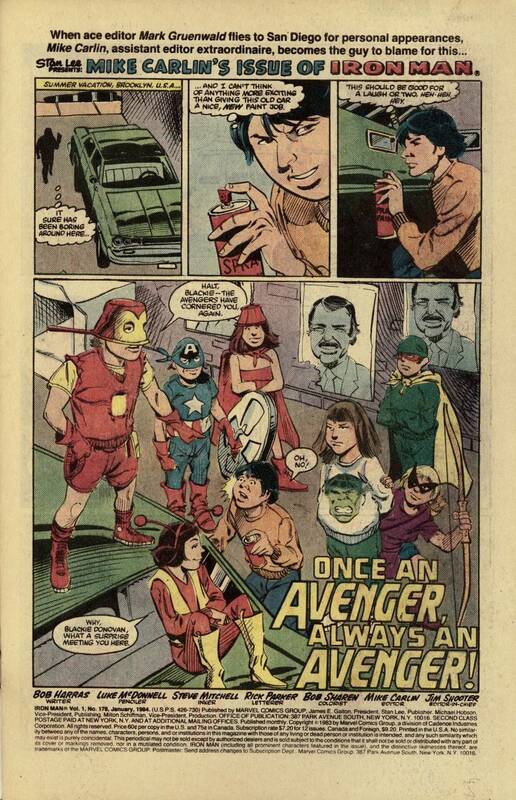 When I was a kid, I had a friend who always insisted on strict adherence to comic book "continuity" when we played "superheroes". 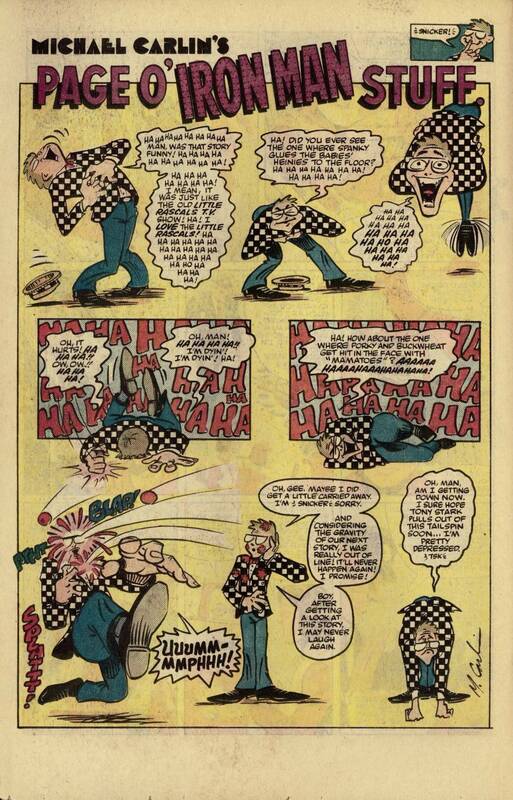 For instance, when we played with Mego dolls, we couldn't use the Joker because Joker was "dead" at the time. 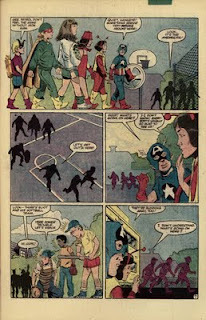 Mikey begs the team to let him stay, but their decision is final. Mikey wanders the streets, dejected, and discards his “helmet”. Unbeknownst to him, it’s picked up by a shadowy figure, who absconds with it. 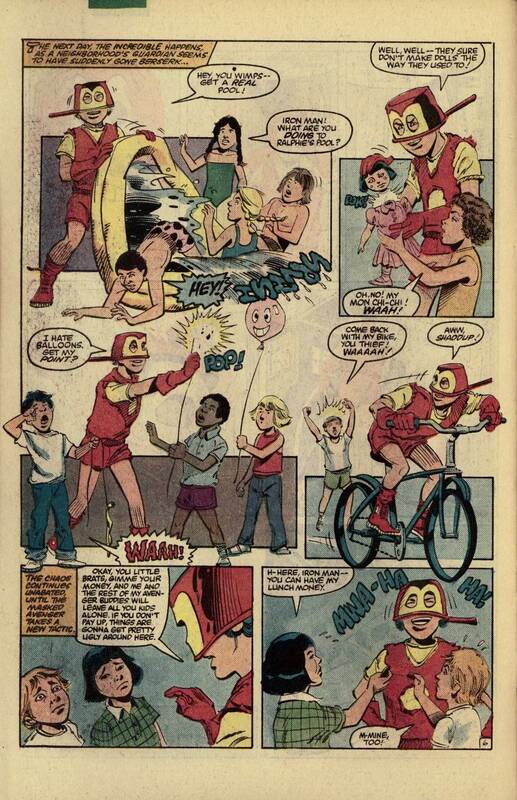 On the following day, Iron Man goes on a bullying rampage, breaking toys, stealing bikes and taking lunch money. When the Avengers go out on a neighborhood "patrol", all the children run away from them in fear. 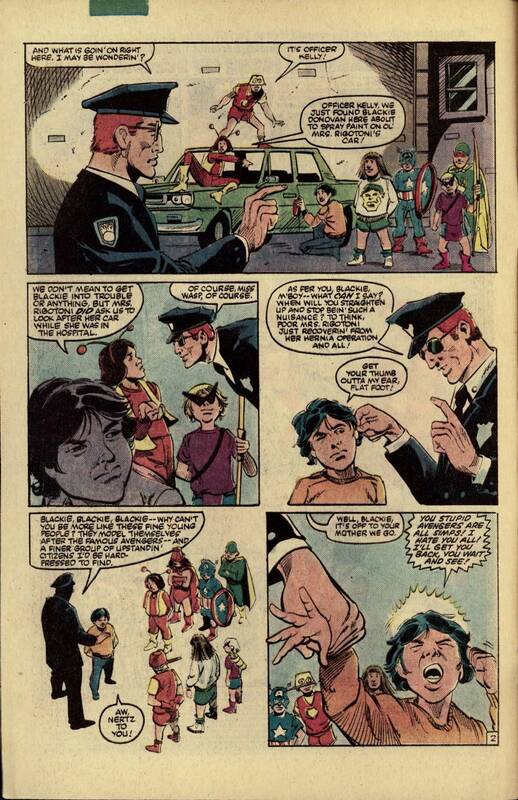 They’re confused, until Officer Kelly tells them of Iron Man’s recent shenanigans. 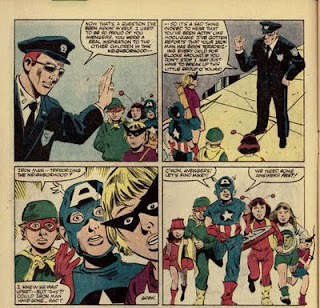 The Avengers are determined to get to the bottom of this! 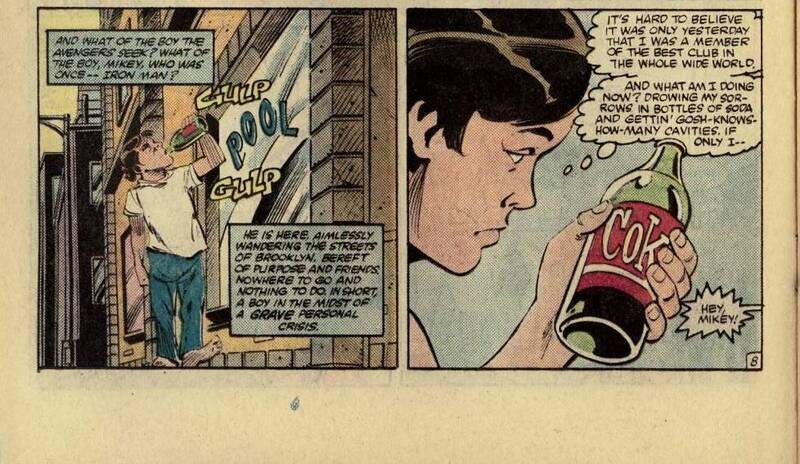 Meanwhile, we catch up with Mikey, who just like his hero Iron Man, is “hitting the bottle”…the Coke bottle, that is. 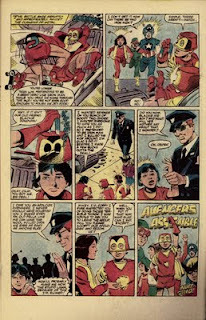 Mikey’s former teammates chide him for Iron Man’s behavior, he pleads innocent and decides to clear his name, Iron Man-style! 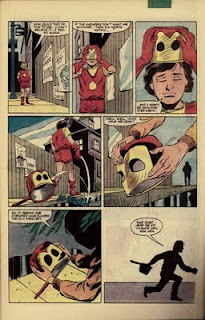 We get a nice "montage" of Mikey modifying a suit of armor. 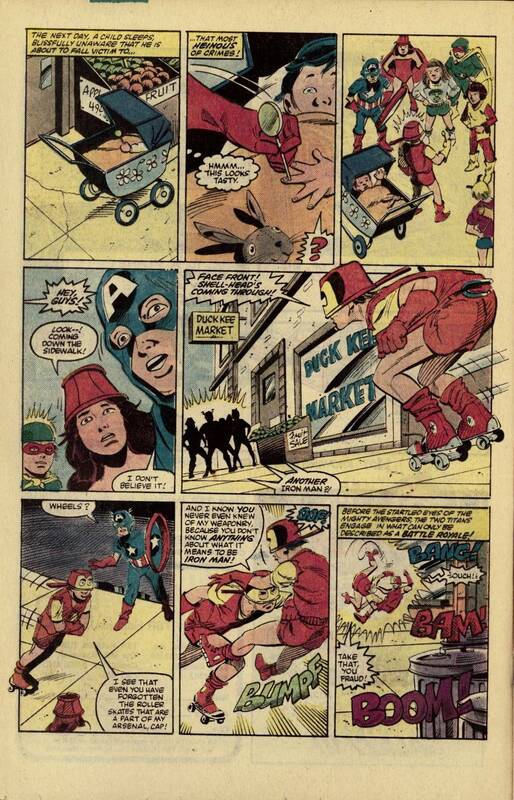 A day later, we find Iron Man(literally) taking candy from a baby! Suddenly, the Avengers show up, followed by another Iron Man...on roller skates! Before anyone has a chance to yell "Shoot Us both,Spock! ", the battle is over! 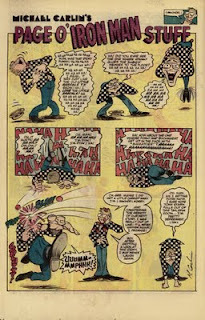 The bogus Iron Man is unmasked and revealed to be none other than...Blackie Donovan! . Officer Kelly shows up and tells Donovan he's taking him home to face his mother's punishment. The Avengers apologize and offer Avengers membership to Mikey. 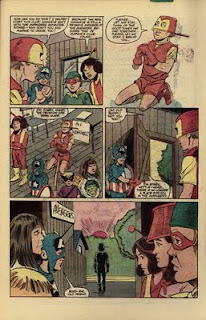 He accepts their apology, rejoins the team, and our story ends with the Avengers traditional battle cry! He's laughing over the previous tale about the kids, which prompts him to go on a tangent about 'Little Rascals' short films. 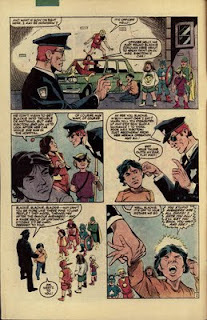 But then he remembers how sad the issue's next story is and fights back tears. And that's where I'll leave you, next time we'll cover Part 2 of this issue. Thank you Bob Harass, Luke McDonnell,Steve Mitchell and Mike Carlin for another fun AEM story! 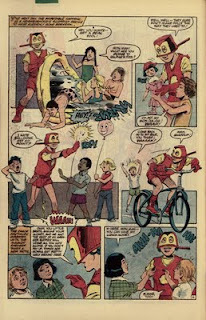 do you have a full collection of old IronMan comics? if you have could you post some scan copies of it and post it here on your site? Sorry this is so late, didn't see it until now. Nope, I don't have many issues of Iron Man.